I do most of my hiking in the desert Southwest, but occasionally get up into the Pacific Northwest and my old stomping grounds in Northern Minnesota. I am a comfort-weight guy when it comes to most gear, trying to stay as light as possible but I don't go to extremes. I rarely clean my gear, but my tent footprints and floors are in desperate need of rehab after numerous Grand Canyon backpacking trips. This product is designed to clean dirty outdoor gear and renew water repellent properties. Granger's is a bluesign(r) system approved company, which provides assurance that the products are manufactured in an environmentally-friendly fashion, and should be reasonably safe to use. Cleaner: contains <5% non-ionic surfactants; preservative (1, 2-benzisothiazol-3(2H)-one, 2-methyl-2H-isothiazol-3-one). As the name implies, this is a "kit" that contains everything in the box needed to renew camping shelters: cleaning solution, applicator sponge, and a spray bottle of water repellent. In the above photo, upper-left is the front of the box, upper middle the back of the box, lower left is the box contents. Upper right is the back of the Cleaner bottle, lower right is the back of the Repel bottle, both showing the instructions for use. Usage seems pretty straightforward with only the cleaner requiring mixing with water, the Repel solution is used full-strength from the spray bottle. I will likely use rubber gloves for the cleaning solution to avoid skin contact, and use both products outdoors. Good thing I live in Arizona where the weather is nice enough to do this outdoors year around! Testing strategy: I have two tents that I use with "footprints" extensively in the Grand Canyon. They are pretty filthy with red Canyon sandstone, and one tent is over eleven years old. I will likely tackle these first, then have a look at my tent floors to see what kind of shape they are in. I have four hammocks with associated tarps. Because they hang off the ground they are not too dirty, but I'll inspect them to see if they could use a touch up. 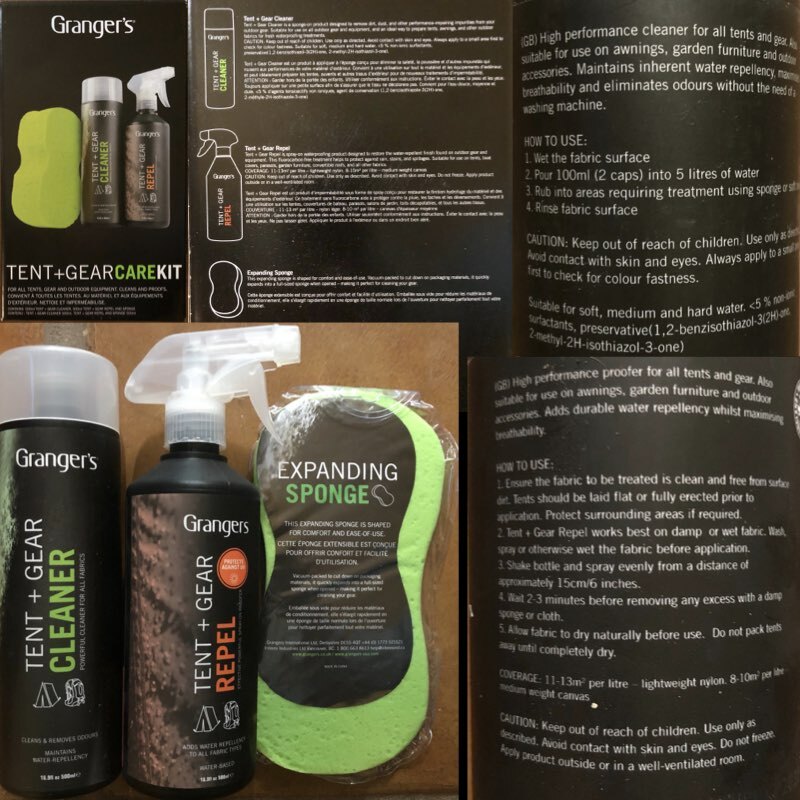 The Granger's Tent + Gear Care Kit is a complete solution for cleaning up my act. I have never been much of a "clean freak", but I look forward to seeing what the product can do with my camping shelters. I have no concerns over the product or its use. Thanks for reading this Initial Report, stop back in three to four months for the Long Term Report. Many thanks to Granger's International and BackpackGearTest.org for the opportunity to test this product.